The joy of every woman hopeful of becoming a mother some day is to actually live to experience that beautiful moment when she welcomes her own child. A lady identified as Madu Aburo Chukwu is currently basking in the joys of being a new mom. What makes her case worth celebrating is the fact that she was once called a barren, cursed wife and a 'woman man' by a fellow woman on a Facebook platform for women simply because she was yet to conceive. A post by Facebook user, Obukaifedi Lois Agunabor who rejoiced over the birth of her child wrote: "I'm a lover of good news and this particular one got me dancing and crying I remember that fateful day that this woman was called BARREN by her fellow woman here on Facebook. That day I cried cos I put her in my shoes and I know how it feels to be tagged BARREN. But one thing about me is that I have so much Faith in me that God will never leave that word unanswered and today God proved Himself strong and mighty in her life. She's now a mum." "God wiped her tears away at His own timing.He is not a man that He should lie. He said that there shall be no Barren woman among His people. And He proved the enemies wrong. He is a great God that's all I know. God is too faithful to fail. He is a covenant keeping God. Thank you God of the eleventh hour for this great miracle. Welcome to the world of greatness Princess. Ugo Treasure Mathson Onyemaobi your testimony shall remain permanent ijn Amen. I tap from your testimony.Congratulations Darling. 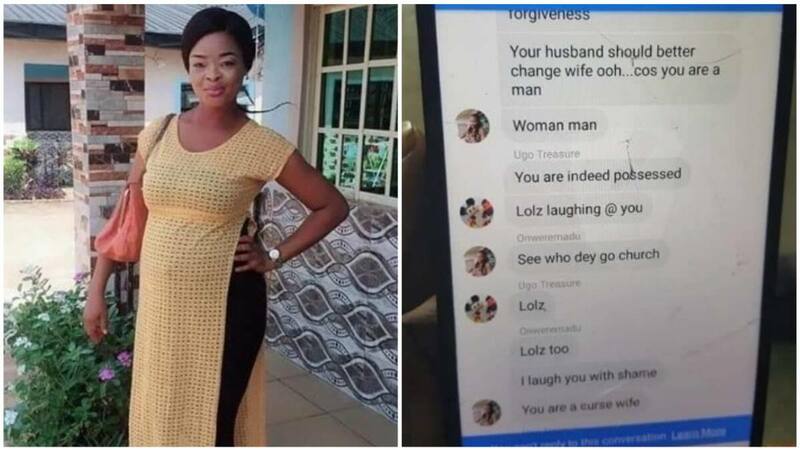 MADU ABURO CHUKWU"
Anther Facebook user wrote on the issue and shared screenshots of the conversation in which the new mother was insulted in a Facebook group for moms over her lack of children. Identified as Emily Miles, the 55-year-old woman stepped in as a surrogate for her 31-year-old daughter, Tracey Smith, who was born without a womb. Tracey who was worried that she would never have a child of her own became hopeful when her mother made the decision to carry her child.